Low profile cover designed to attach to the EFB45S style floor boxes. Each cover is made of die cast aluminium and is equipped with a durable hinge which allows the cover to rotate open 180o, and two (2) slide egress doors that lock in the open position and automatically close around the cables when the cover is closed. The cover assemblies are designed to sit flush with the finished floors such as: carpet, tile, and wood. In order to make the cover assembly flush with the polished concrete or terrazzo floor the EFB45-CTR (concrete/terrazzo) ring must be used (ring sold separately). The cover assemblies are available in six (6) powder coat finishes: black (BK), gray (GY), brass (BS), nickel (NK), aluminium (AL) and bronze (BZ). One box many applications. Evolution Series Floor Boxes are designed to work in concrete, raised and wood floor applications and are fully adjustable both pre- and post-concrete pour. 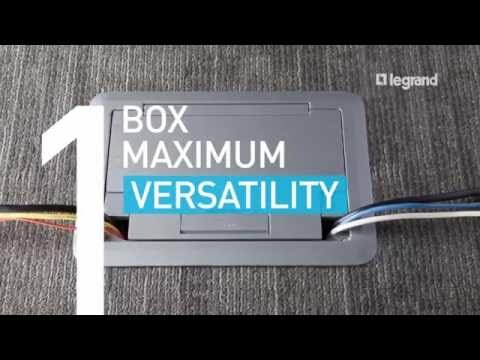 A single box can be specified for multiple floor types without having to order additional components or accessories. Configurable with removable modules. In addition to having removable dividers and a tunnel feature that allows all compartments to be connected, the modules are removable through the top or back of the floor box. This allows for easier installations and facilitates moves, adds and changes without having to disconnect services, saving time and money. Audio/Video Design. Evolution Series Floor Boxes have been developed specifically with the A/V industry in mind. With 3 1/2" - 3 7/8" [89mm x 98mm] of wiring capacity behind each device plate, these boxes will accept devices from leading A/V manufacturers including Extron® Electronics and Crestron®. Durable 180° articulating hinge. Hinge design enables covers to open a full 180° and lie flat on the floor surface with the durability to support a large cover. Provides easy access to all interior modules and activations while reducing tripping hazards. Auto-close egress doors. Cable egress doors lock in position when open, and automatically closes around wires to protect cabling and reduce trip hazards. Die cast aluminium cover assemblies. Evolution Series Floor Box Covers have been designed to work on multiple floor surfaces and are manufactured from die cast aluminium to provide strength and style. Decorative powder coat colors (black, brass, bronze, gray, nickel, and aluminium) will complement any room décor. Finished interior. Fully finished interior removes the unfinished industrial look while increasing visibility, making it easier to see where to plug in devices.